Associated with the sinking in the soft soil or loose sand piling is being set when the steel sheet piles is likely to be adjacent to the pile under the problem often in the piling up to the design of the height of the pile into the pile of friction. ⑤ The lock is damaged or connected with another. Vibration piling correction method: the board pile to the required elevation, and in pairs with the location of welding together, and then hit back with the screen, the pile is usually easier to break into the soft soil. You can also use the impact hammer instead of vibration hammer, when encountered with local pile, the simplest precaution is to co-sink the pile to the temporary guide to the purlin, but the purlin need to have enough support to prevent the piling The process of moving or overturning, if the pile of vertical and straightness is good, then joint sinking rarely occur, the use of locking sealant to reduce the access to the lock of the soil can also alleviate this situation. 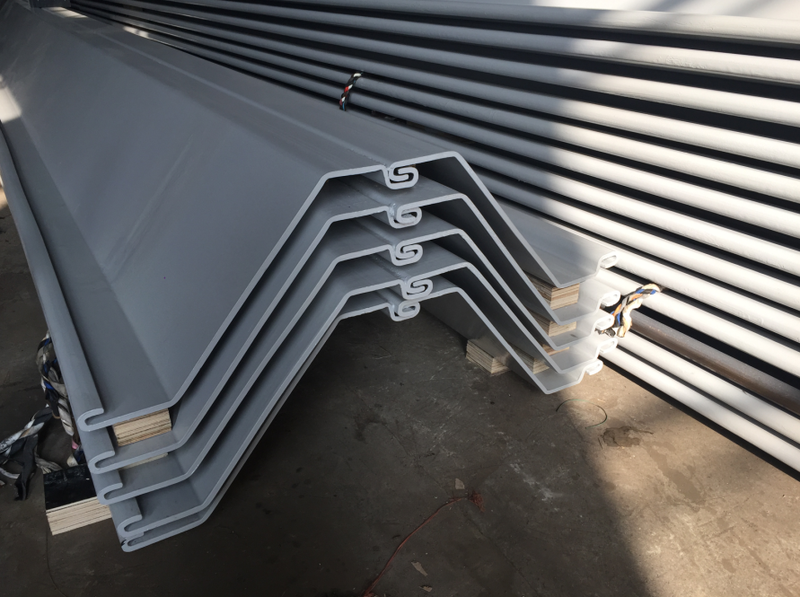 Pile wall length control When the use of lock plate is not crimped steel sheet pile by adjusting the direction of the purlin to the distance between the lock and the appropriate rotation, can be a small amount of pile wall to adjust the length of the plane. As the rotation of the lock will affect the appearance of the wall appearance, increase the pile resistance and tripping probability, so permanent construction is not recommended to use this method. When the sheet pile is crimped in pairs, the position and direction of the sheet pile have been fixed due to crimping, so that the length of the pile wall can not be adjusted in this way. Piling error usually the location and direction of the sheet pile are marked in the construction drawing, but due to rolling error, soil conditions and piling processes and other reasons, 12 The meter-length SP-V Larsen steel sheet pile will deviate from the theoretical layout.